This has nothing to do with seashells, but it’s a re-make of my popular change of address postcard featuring the Speedway at Daytona Beach. 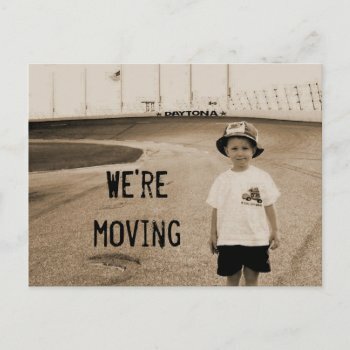 My first “moving” postcard was made without a template area, but now you can easily add all your moving information to the little box provided. Just order and mail. Here’s the story behind the photo. My son (in the picture) and his dad went to Daytona to a car show at the Speedway. It was only about 30 minutes north from where we lived at the time. They saw an opportunity to get this shot, which came out pretty good, and it’s been a favorite of ours. I decided that it would make a unique “moving” postcard, especially for the race fan!